Yesterday I shared these Salted Pretzel Bread Bowls and so many of you mentioned soup. Which is exactly why I made them. I mentioned last week that my annual soup kick is in full swing here. The only thing that makes my soup kick better and easier is quick soup. Quick Chicken Noodle Soup, that is. There is something so comforting about chicken broth, herbs, veggies and egg noodles. Nothing better,my friends, nothing better. This soup is perfect for a chilly fall evening. It’s extremely simple and healthy and full of flavor! Not much reminds me of my childhood more than this combination of herbs, broth, veggies and chicken. Both sides of my family have not only made homemade chicken noodle soup for as long as I can remember, it’s been a tradition to make noodles from scratch too. Nothing beats homemade noodles. And while I did use store-bought in this recipe, I would pick homemade any day. And I would eat them every day if I could. Don’t forget to enter the Red Star Yeast Platinum Giveaway going on NOW! Quick & classic chicken noodle soup: chicken, carrots, celery and egg noodles in herbed chicken broth. Preheat the oven to 400 degrees. Brush the chicken breasts with olive oil on both sides and season with 1/4 teaspoon of sea salt and 1/4 teaspoon of pepper. Place on a non-stick rimmed baking sheet and roast in the oven for about 20 minutes, until the chicken is cooked through. Remove from the oven, cool for 10 minutes, and then shred with two forks, or in a stand mixer. While the chicken roasts, heat the olive oil in a large Dutch oven and add the onion, garlic, celery and carrots with a small pinch of salt and cook until for about 5 minutes until the veggies begin to soften. Add the parsley, thyme, sage and oregano and bay leaves and stir well. Cook for another 7-8 minutes until the veggies are very soft and fragrant. Pour in the stock and bring to a simmer, and cook for another 10 minutes. Add the egg noodles and continue to simmer until they are cooked through. Add the shredded chicken and remove the bay leaves. Season with additional salt and pepper if desired. To make this even simpler, use rotisserie chicken, or leftover shredded chicken. I’m also in complete soup mode, I can’t make and eat enough of it! Love this and those bowls look amazing. LOVE soup in a bread bowl! Mmmm…these look SO comforting. Love me some homemade chicken noodle!! The soup bowls look SO yummy and love the homemade chicken noodle soup. We’ve been on a soup kick at our house too– love this time of year! So lovely Cassie, all I can think about at the moment is home made soup and this looks like something that we’d absolutely love! There is nothing I like better on a cold winter day than a hot bowl of chicken noodle soup. It is total comfort food! And in a fun pretzel bread bowl…yum!!! Look at this!! What a perfect idea to spice up the regular boring old soup. YUM! I’m with you; nothing better than homemade chicken noodle soup! I love that you served it in those delicious bread bowls. I think I just fell MORE in love with chicken noodle soup because it’s in the delicious looking bread bowl. My kids love chicken noodle soup. I love how hearty yours looks. Seriously. Soup in a bread bowl and beer, and I’m set for the entire winter. Mmmmmm! I have a wicked cold right now and this soup looks like the perfect medicine – lovely, Cassie! I would want to fly through the soup and get to the bread bowl 🙂 Both look killer! There are those beautiful bread bowls again – this time filled with PERFECT looking soup! My husband would love this! It looks so warm and comforting! 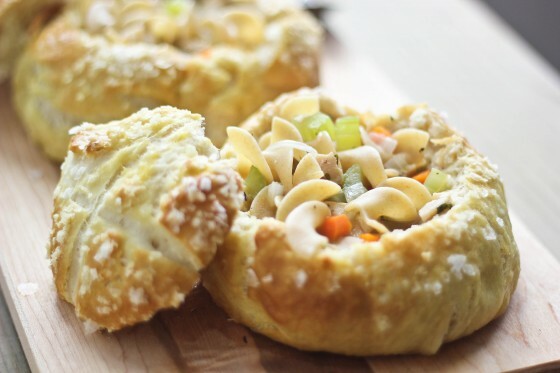 I love that you filled these gorgeous pretzel bread bowls with such a hearty, comforting soup! I could totally eat this everyday for breakfast, lunch, and dinner! 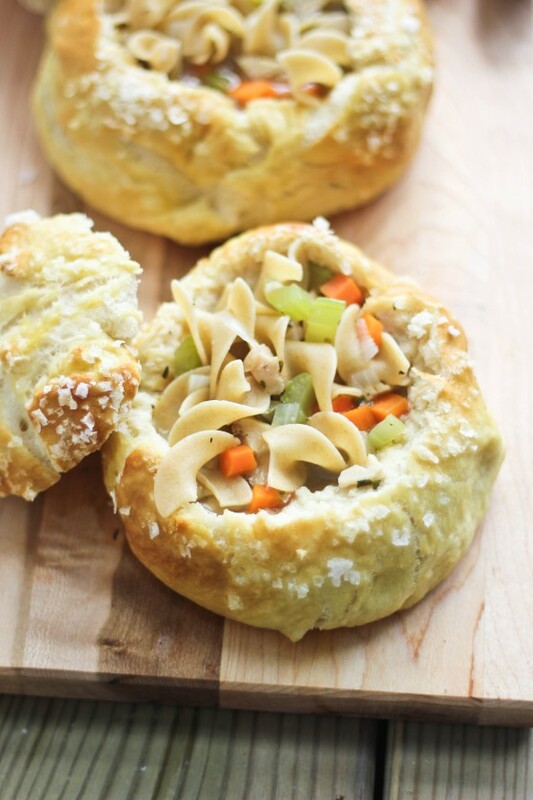 Yum, this is the perfect use for your bread bowls! Oh holy yum! This is one of my favorite comfort foods + I love that you used bread bowls! OH MY GOD YES!!!!! Way better than panera. we must be on the same wavelength because i’m all into soup too! except today was unusually 80 degrees – so weird. anyway, i’ll be making a version of this classic soup soon – i love that yours is in a bread bowl! I want to curl up in that bowl and take a nap! Ohhhh it’s so soup season!! Beautiful and those bread bowls have my heart! Still drooling over those pretzel bowls! I make my chicken noodle soup in my pressure cooker, but otherwise it’s quite similar. I love how you infused these rolls with SO MUCH COMFORT! I want to cuddle with them. Dude, egg noodles are the best! I make a similar recipe to this guy only I go the chicken drumstick route. I seriously can’t wait to make both of these dishes! Soup in a bread bowl.. there isn’t a better combo. Especially since these are pretzel bread bowls (which make them the best thing ever!) and hearty chicken noodle soup. I puffy heart this! 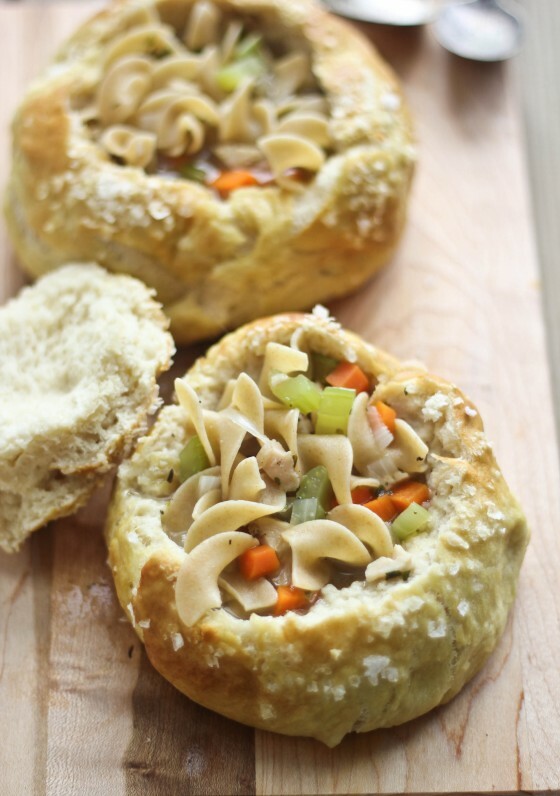 This soup looks great…especially in a pretzel bread bowl! Tummy flu hit here so we too have been in soup mode… and I want to know how to make the bowl!!!! Oh my, the soup looks fantastic in those bread bowls Cassie! I was just reading that bread bowl post and I almost fell over… I love pretzel bread to begin with, a pretzel bread bowl is even better, & then add this soup! Must try! It finally got cold in Portland, so this soup looks pretty darn good right now. Plus, pretzel rolls? Hello! bookmarked! !, I luke youг site!